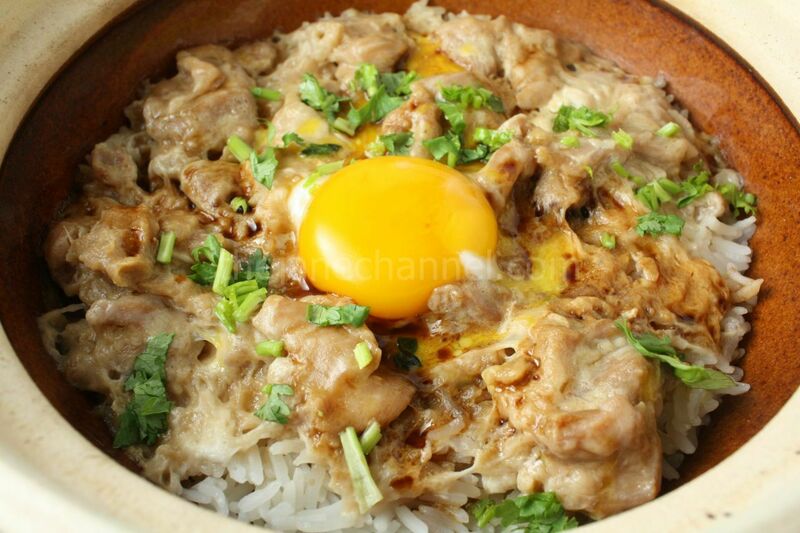 Because clay pot rice is so simple and delicious, we are having it very often recently. This is the dish for this week; hopefully we won’t run out of new clay pot ideas. This pot is similar to some dishes that I posted before in different ways. It is like Oyakodon in that it has egg and chicken on rice. We use egg white and corn starch to marinate the chicken thighs, which is the same technique we used in Claypot rice with chicken and mushroom. 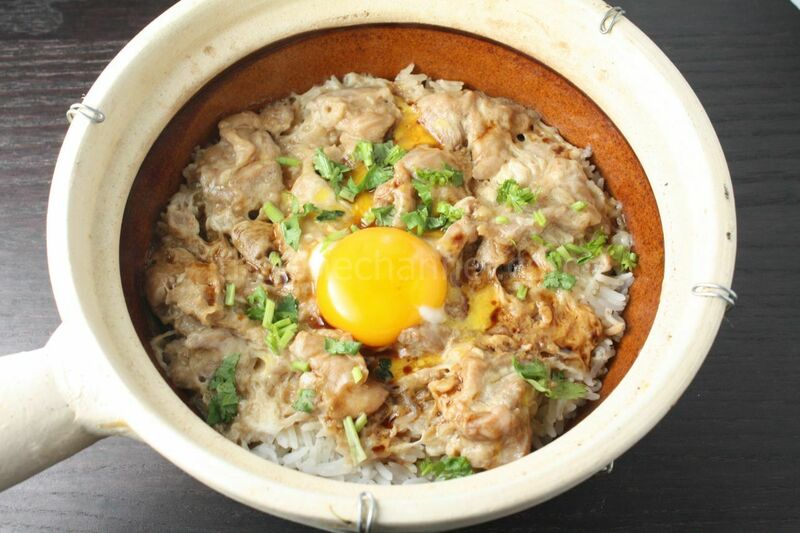 Lastly, it uses a runny egg yolk in the middle, just like Claypot Rice with Beef and Egg. After the chicken is marinated, it takes less than 30 minutes to prepare dinner. In a saucepan, add 3 tablespoons water, 1 tablespoon sugar, 3 tablespoons dark soy sauce, and 1 tablespoon soy sauce. Cook over low heat until the sugar dissolves. Marinate the chicken pieces with egg white and corn starch for 20 minutes in the fridge. Then add soy sauce, oyster sauce, sugar and sesame oil. Marinate for another 30 minutes or so. Wash the rice with water until the water comes out nearly clear; drain completely. Thinly oil the inside of the claypot. (Apply oil to the pot before adding rice and water to avoid sticking and to make a crispy rice effect.) Heat over medium-high heat. Add the rice and water and cover. Bring it to boil then add chicken. Cook over low heat for 20 minutes. Turn off the heat and cover for another 10 minutes or until chicken is cooked. Add the egg yolk and cover for a few minutes. Add cilantro and drizzle sweet soy sauce over rice to serve.